You know those times when you just know you did something not right, if not downright foolish? Yeah, me too. So... Teaching a fusible appliqué class the steam-a-seam would not stay adhered to its paper backing enough to get the images traced on. I of course said I will just press it back on knowing I needed a pressing sheet or parchment under the fusible but instead I carefully laid it out on the ironing board and applied the heat. Now I have a 12x14 patch of fusible web quite firmly adhered to the cover. 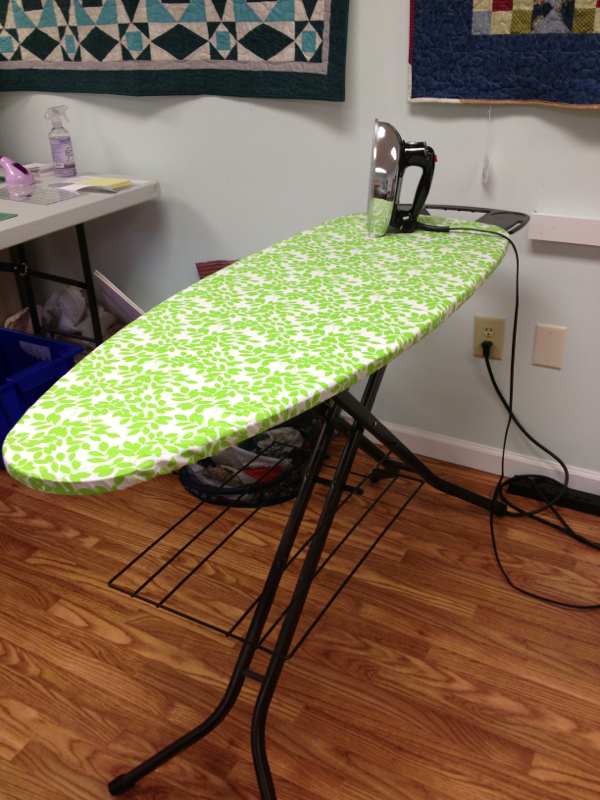 Oh well, I wanted to try making an ironing board cover anyhow. I was pleased with how easy it actually is to make a custom cover. After removing the old, now fused, cover I laid the board face down on a length of pretty new fabric from the clearance table. If I was at home it might be a good place to use a couple yards of an old piece from my stash. I traced around the board adding 2 1/2 inches. When (note "when" not "if") I have to do it again I think I will make that 4" instead. Cut out the cover on the traced lines and take it to your sewing machine or serger. My serger is at home waiting for service and to be relooped so I used my regular machine. Finish the edge with either a wide zig zag stitch or an edge stitch. Maybe someday I can get my edge stitch to not just roll up the edge. Anyhow I zig zagged all the way around. Next you need to make a casing for elastic (or a piece of cord if you would rather). Fold over the finished edge enough for your elastic and stitch (straight stitch, don&apos;t forget to turn off the zig zag). Leave an opening to insert the elastic. I used 3/8" elastic because I had it laying around. I think 1/4" or 3/8" is probably a good size. I used a safety pin to pull the elastic through the casing. I probably used about 2 yards of elastic, it will vary depending on the size of board you are covering. You need enough to hold it tight but long enough to be able to get it stretched around the board. I just pinned the 2 ends of the elastic together so I can reuse it the next time I have to make a new cover. I also put a layer of Warm Tater batting underneath. Next time I might do 2 layers. I love the look and feel of the new fabric as it comes into the shop. At the same time I look at the cost of this premium high quality fabric and realize how much goes into every quilt we make. Quilting is time, skill and love transforming fabric and thread into works of art, of comfort, of hope, and of faith. Whether our quilts are to warm our homes, bring joy to our children and grandchildren, comfort to the sick or hope to the homeless we want to make something that will last, hold its beauty, and hold up to the stresses of life just as we do ourselves. This is why I use high quality fabric. Higher thread count fabric holds together through the daily use and washing that a well loved quilt is subjected to. The colors stay vibrant, the seams stay stitched and the quilts gets softer and even more perfect with time. Yes, I can make less expensive quilts. But my time is the real value in a quilt just as your skill and time are what really adds the love and beauty to your quilt. it is worth it to me to put quality fabric in my projects so they are as beautiful after the 10th time through the washing machine as the first; so that my grandchild can cuddle his quilt through many years of love; or so, like my daughter, can proudly display that well loved quilt almost 30 years after she received it. Her aunt put hours of love and skill into a hand pieced and appliquéd quilt and the quality of her work, and her materials, still shows to this day. Quilts are cherished, whether they are made of old shirts or the newest expensive fabric. Choose good quality fabric regardless of the source and build your quilts with love and skill to bring joy for years to come. Hard to believe we have been here in Georgia for almost 2 full years and are starting on our 3rd summer in the south. What a beautiful spring it has been, and the lake is full to add to the wonder of living here. I miss Vermont, but it has been snowing there this weekend (yes, Memorial Day Weekend) and it is so nice here that I can't envision being anywhere else today. Lots of changes have taken place at Annies Pretty Pieces in the last two years. John has taken up quilting, I think in self-defense. Either that or sheer boredom when the store is quiet. All of his work gets lots of positive comments, right now he is working on a miniature quilt and I think is almost ready to go back to some big block work after all these 2” half square triangles. We have been joined by Libby in the store 2 or 3 days a week. Her creativity, positive attitude and customer service skills have been a wonderful addition to our little shop. Almost all of our original design quilts hanging in the shop were done by Libby. In early 2013 we added an additional section to the store, enabling us to create an expanded classroom (and even add a refrigerator and a microwave for all day classes). Freeing up our small classroom gave us room to move a nearly vintage quilting machine in. We have now started giving classes on the Design-a-Quilt machine. 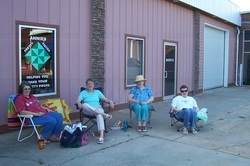 Students who complete the training can rent the machine by the day or half day to do their own quilting. The Design-a-Quilt is a short to mid-arm quilting machine with a limit of 6 1/2” quilting design and is designed for edge-to-edge pantograph quilting. Now I just wish I had time to get all of our quilt tops completed on it. Maybe the next person to take the class on using the quilting machine should be John. What's Next? A good question. We will be holding a 2 day sewing class designed for girls from age 12 to 16 in June, we will take a short vacation in July, but Libby will have the store open during the week for your convenience. We are investigating adding a Marti and Me club from Marti Michell after she was gracious enough to visit us a few weeks ago. (If you have used any of her tools you may be as excited as we are at this possibility). The Christmas Peace Block of the Month starts in June (sign up quick, there are limited spots available). We are looking for the next Block of the Month to start once the current Marti Michell program ends. We would love to hear what you would like to see us offer in the near (and not so near?) future.